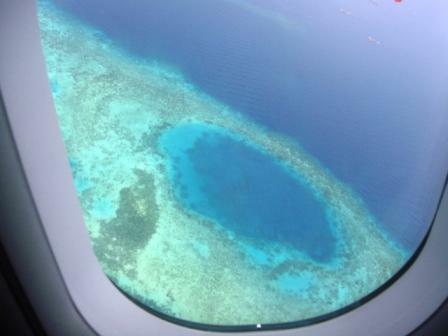 The last time I was in Bohol was in 2007.It was memorable because it was my first plane ride and my first out-of-Luzon trip. 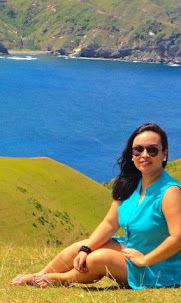 I was bedazzled by the beauty and serenity of Bohol and promised myself to comeback with the rest of my family. Thanks to AirPhilippines 88 seat sale last year, I was able to book Manila-Tagbilaran-Manila tickets for my whole family. We were 6 adults and 1 child at a total of about P1,200.00, for the entire group, not per pax. It was indeed a steal! 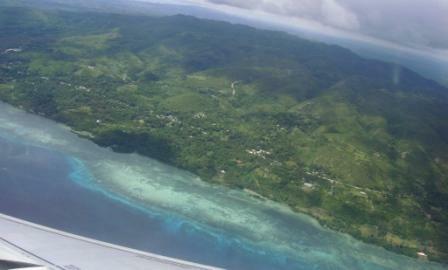 Though this is a second visit to Bohol for me, it was a memorable first for my family. 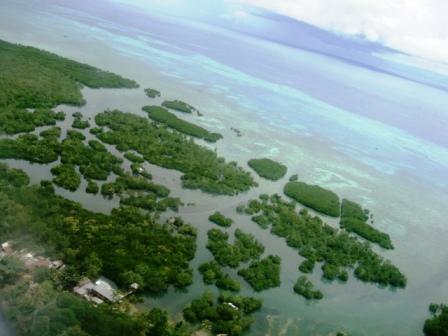 Here are some aerial shots of Bohol. 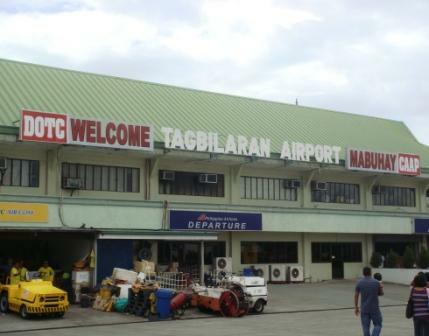 The flight went smoothly, thank god, and we arrived at 1pm in Tagbilaran Airport. Nothing much changed since 2007. A year in the making, I researched about trusted tour guides and resorts in the net. In Girtalk, my ever reliable forum, Kuya Tatsky is the most popular tour guide alongside with Kuya RJ, as they are known for low rates and their flexible itineraries. Since we were just 6 pax and a baby, I decided to rent Kuya Tatsky's Innova. Airport transfers are P600 per way and countryside tour is P2,400, as Kuya Tatsky stated in his text "until sawa service" (tour 'til you drop). As far as I know, Kuya Tatsky is the only one offering Innova for mid-sized groups. 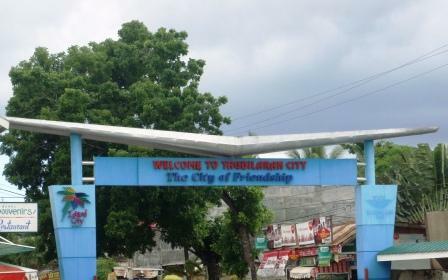 Usually, tour guides will offer you either a car (good for 4 pax) or a van (good for 8-10 pax). He also has a van and a car. You may reach Kuya Tatsky at 09223671051. 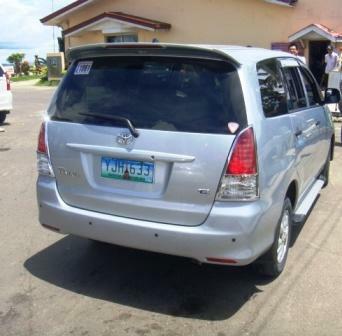 Here's Kuya Tatsky's Innova, our companion for the rest of our Bohol trip. 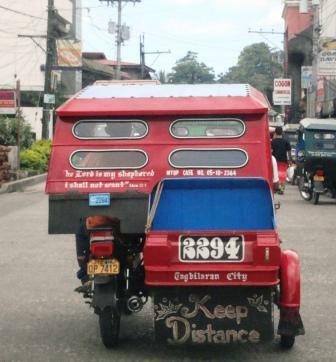 On our way to Panglao, I noticed that the tricycles have either a bible passage or some spiritual sayings at the back. Our driver, Kuya Edgar said the it is mandatory for tricycle drivers to put such sayings in their cabbies before they are granted permits/registration. 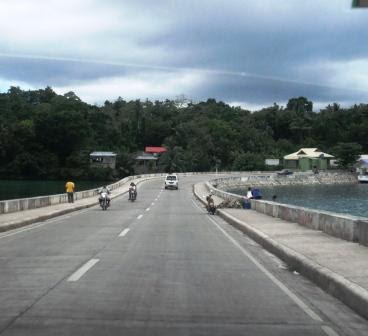 Panglao is an island and this bridge connects Panglao to Tagbilaran City. Travel time is about 45 minutes. 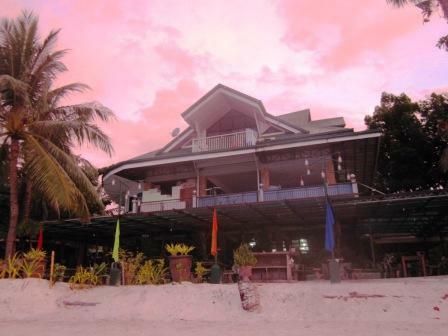 Finally, we arrived in Dumaluan Beach Resort where I booked 2 Standard Aircon Rooms at P 1,300 per night. The rooms are clean, spacious and can accommodate up to 4 pax. Just add P250 for extra mattress. I chose Dumaluan Beach Resort because the last time I was in Bohol, we were booked at Alona Tropical Beach Resort, along Alona stretch, so after reading good reviews about the Dumaluan side being the more serene and exclusive part of Panglao, I decided to give it a shot. My Akisha is having fun! See? Lots of people in there! This is crowded than what I remember of Alona Tropical's beachfront. 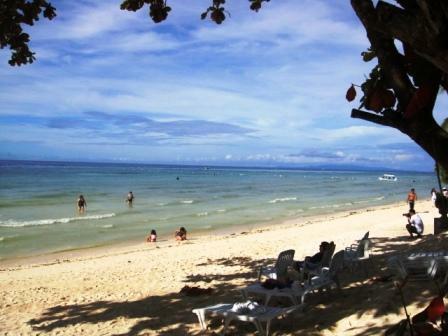 But that was years ago, not sure how crowded Alona is nowadays. 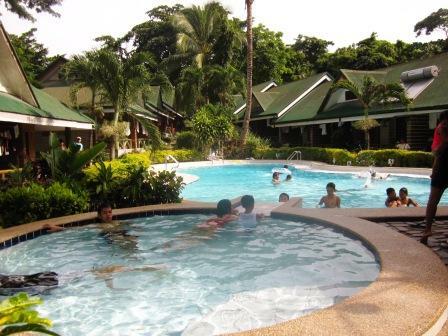 They also have a pool open from 8am to 12 midnight. 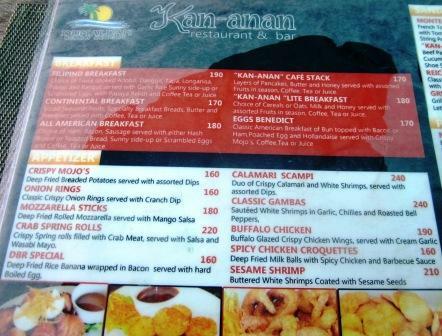 This is the resort's resto, servings breakfast to dinner. They also have live bands at night. Since our rooms are not inclusive of breakfast, we checked out their menu. Their buffet breakfast is P250/head but the viands we saw there was a bit scarce, like corned beef, scrambled eggs, fried rice, fresh fruits like watermelon and fruit juice. So we decided to order ala carte. We ordered Pancit Molo since my baby is a soup-aholic. This is good for 3-4 pax. But since we're 6 and we still have other food, we were able to have a small bowl each. 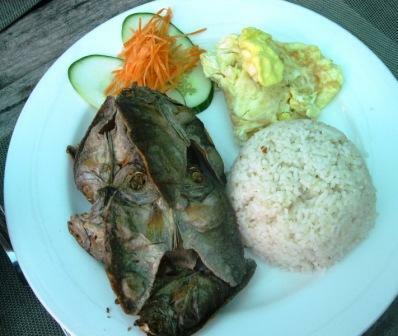 Ala Carte Filipino Breakfast at P190. Serving is big, it can be shared by 2 pax, unless you prefer heavy breakfast. 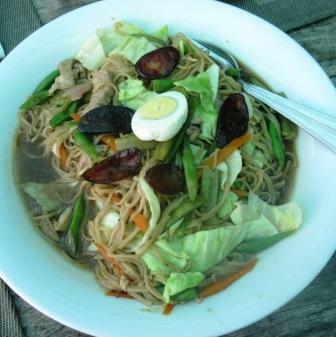 This is my favorite, Pancit ni Yoyoy at P240. 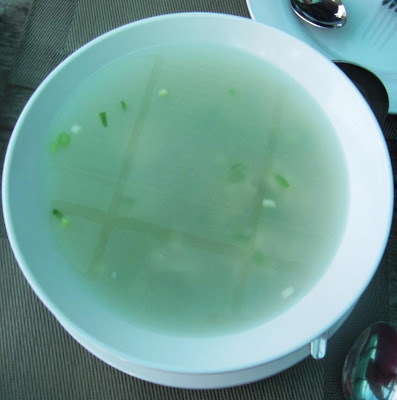 If you will eat this alone, its good for 2-3 pax. It's a saucy kind of pancit with seafood, chorizo and veggies. Yum! 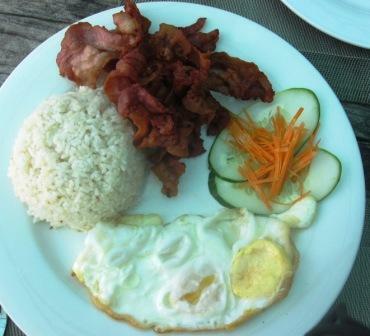 Total damage for the hearty breakfast P900+, good enough for 6 pax. Divide it and its roughly the same as the buffet breakfast, however, with this, the choice of food is all in your hands. 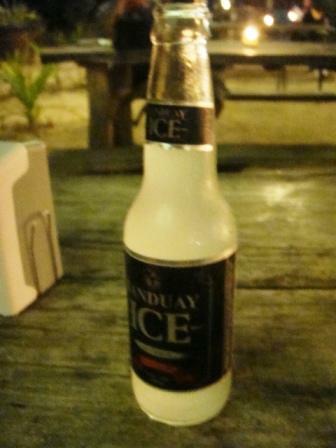 At night you can grab a booze like Tanduay Ice or San Miguel Beer at P65/bottle. 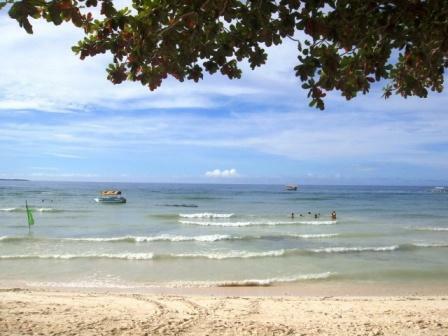 My verdict, I am still not sold that Dumaluan Beach Resort is the more quiet side of Panglao, unless of course you will stay in Bohol Beach Club or Eskaya. The area of DBR is ALSO crowded just like the Alona side, especially at night, where some locals occupy the huts in front of DBR Grill (another food option). Also, it is often low tide in the afternoon so the beach is more like a golf course, just kidding. 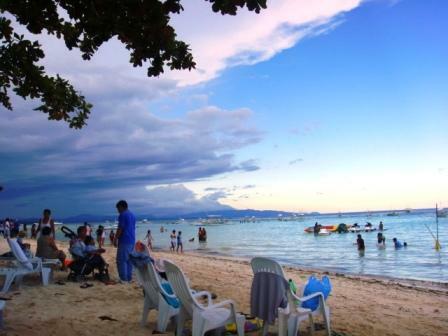 Whereas, in Alona, or at least in front of Alona Tropical, we never experienced un-swimmable low tide there. Is this DBR 1 or 2?